What self-storage operators need to know from a liability standpoint if they plan to store cars, boats, RVs and other vehicles at their self-storage facility. Those who think vehicle storage is just another form of self-storage couldn't be more mistaken. The storing of vehicles involves many differences in facility operation and your business rental agreement. Not only do you have to obtain more information from the customer, you have to address unique value limits, insurance requirements, default procedures, and rules and regulations. 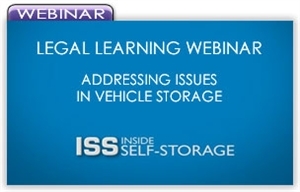 This webinar teaches what you need to know from a liability standpoint if you're planning to store cars, boats, RVs and other vehicles at your self-storage facility. Legal Learning Webinar - What's Wrong With Your Self-Storage Lien Sales Since the Advent of Reality TV?